Bait-tech has added new pellets, groundbaits and liquids to its wide portfolio this season – and there’s no doubt these will all be welcomed with open arms, particularly by commercial match anglers. The Suffolk company, known for using only high quality ingredients, has also expanded the popular Special G range. Last year’s best-selling The Juice liquid is now also available as a stunning and easy-to-mix sweet fishmeal-flavoured groundbait with a rapid breakdown speed perfect for match fishing. Bait-Tech’s new The Juice Groundbait is made to target large numbers of big fish quickly on commercials. A fast breakdown with low binding properties gives it endless mixing options, but it is particularly good when over-wetted as a ‘slop’ mix. 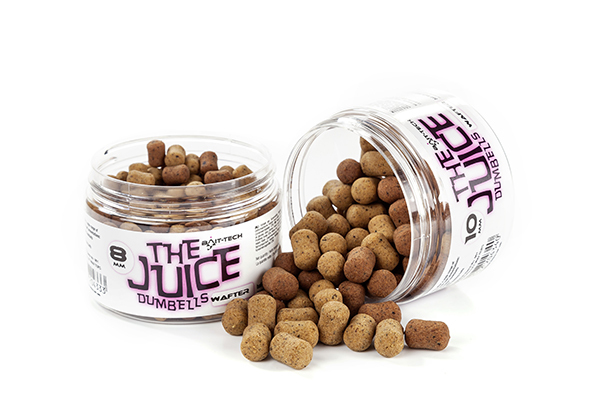 Packed with quality fishmeals, this groundbait has a characteristic sweet note common to all other The Juice products. Perfect for pole work, and any kind of feeder fishing, this intensely flavour-packed bait will get an instant reaction in your swim from carp, F1s, skimmers, bream, barbel and ide. Following the success of its original The Juice hookbaits, Bait-Tech has added Pellet Wafters to the range. In 8mm and 10mm versions with two colours per pot, they enable you to match your hookbait to your feed pellets. Easily attached via a bait band or bait bayonet, carp of all sizes will find these critically-balanced offerings irresistible. These will heighten the attraction of any feed or bait. 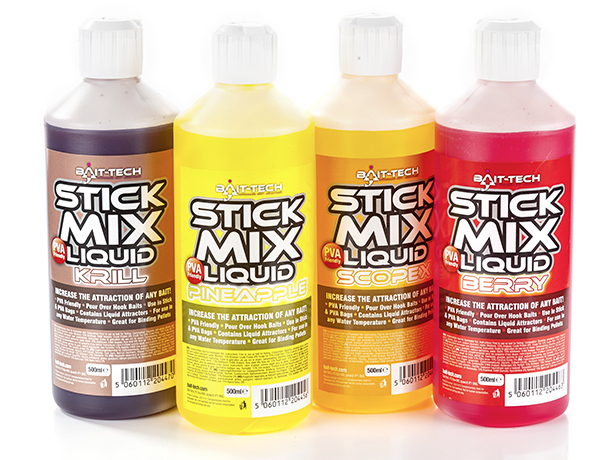 All four flavours – Scopex, Berry, Pineapple and Krill – are PVA-friendly, and ideal for use with solid bags and mesh sticks, when their water-soluble rich flavours will leach off intense flavours around your hookbait. The liquids can also be used to bind micro pellets together for Method tactics. Two great carp baits are brought together in a can, where they are cooked to seal in all the freshness without the need for chemicals or additives. For its Super Seed particles range, Bait-Tech uses only the finest A Grade seeds. Special G glug can enhance any spod mix, soak pellets, or be added to paste and groundbait mixes. The viscous liquid also works brilliantly when dripped directly on to your hookbait, as it slowly melts away to leave an attractive flavour trail. These are versatile enough for both waggler and hair-rigged Method feeder work. They are made from Bait-Tech Xpanda pellets, pumped full of gelatine, fishmeal, and proven attractors prior to drying. At the end of the manufacturing process you find pellets that are not only easy to use without splitting or crumbling, but brilliant fish-catchers. Special G Soft Hookers come in three variations – Dark, Green and Gold – to complement all Special G groundbaits. Do note, these pellets are best stored in a dark, cool location as they can degrade if exposed to direct sunlight. ADF technology processes the ingredients in Big Carp Method Mix, maintaining their high nutritional value. Bait-Tech’s fishmeals are derived from human grade quality fish. The rich, high protein amino-packed food content of Big Carp Method Mix will hold feeding fish in your swim for a long time. New Pro Natural Fine Lake Dark, for use on rivers and natural stillwaters, is rich in milled coconut, molasses and hemp, with a sweet aroma to hold fish in your swim. Its sticky makes it perfect for carrying maggots, casters, hemp and pellets.